In Greece and Italy, rice-stuffed tomatoes are a common dish — and we’ve made a vegan variation that’s sure to please herbivores and omnivores alike. 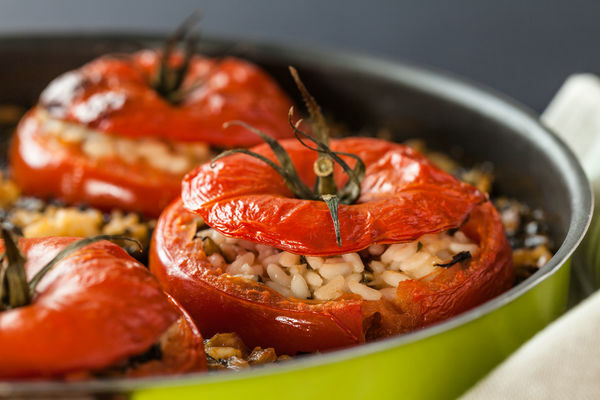 This specific dish was inspired by the Greek gemista, which is used to describe stuffed vegetables typically a blend of peppers and tomatoes stuffed with rice and often cooked alongside potatoes. We’ve stuck to just stuffed tomatoes, and it is a great way to use all those fresh tomatoes in the summertime. It takes a bit of time, but it’s worth it! Put the onion, garlic, a teaspoon of oil, and a pinch of salt into a food processor and mix it just a bit. (Or, simply mix in a bowl with a spoon if you don’t have a food processor just chop the onions and garlic a little more finely).